Get download Prize bond 200 List 2019 online by bondresult.com. The Rs. 200 Prize bond is the old and lowest price bond that routinely buy the general public and salary persons. The low denomination has the highest number of third prizes that another one and this is the only prize bond that has five, a third prize! Otherwise, other prize bonds have only three lucky number included in the third prize announcement. The first prize amount of 200 prize bond is 750000 (Seven Lac & fifty thousand) elected for only one lucky number. The second prize amount is 250000 (Tow lac and Fifty thousand) that is awarded to five lucky numbers and the third prize amount is Rs.1250/- that is awarded to 2394 lucky numbers. You can also try your winning number search from the old draw list. So we have updated all Prize bond 200 Lists for you. On this page, you can download all National savings of Pakistan Rs. 200 Prize bond results lists of new and old draws. This page is designed to facilitate the Rs 200 prize bond owners to find their number from each of the lists. 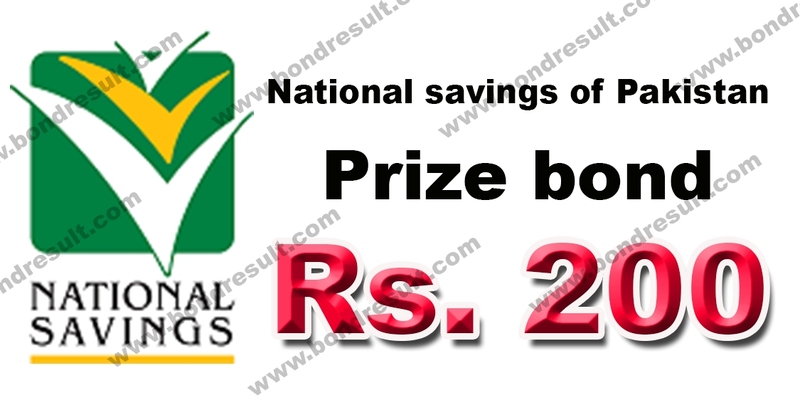 Here you can download and save offline National savings of Pakistan Prize bond 200 List 2019 & all Lucky Draw lists results from 2019 by savings.gov.pk online.